Dr. Demento's Show ran on WLUP in Chicago, and since we were already featured on Johnny's show there, we thought we'd start sending stuff to him as well. Our brand of wacky-ness seemed right up his proverbial alley, so why not? He played the first thing we sent to him and his audience really responded to it. "It's The Real World (After All)" became one of his most requested songs very quickly and rose to #2 on his Funny Five chart. We were thrilled and began sending anything and everything we thought would fit into his format. This led to his airing several more songs and to our surprise a few non-song comedy bits as well, including the fairly long theatre-of-the-mind piece "A Friend In Need," and one of our most popular bits of the time Joe, The Love Potato who made it to #3 in the Funny Five. Thanks Dr. D, we'll be happy to come in for a check-up anytime. "Every Post You Make (We're The NSA)" today and it's got our tail feathers shakin! Hear how it sounded on his program just over there on the right! Dr. Demento let us grace his airwaves once again, by playing our fist new recording in over 23 years: "Green Beer." Take a listen to it from his show on the right. Dr. Demento played "(Breakfast with) Joe, The Love Potato" today! On a food themed show during an all spud segment Duck Logic Comedy has flown onto the airwaves again! Thanks Dr. D, its always an honor to be part of the illustrious list of cultural fun you choose for your show! To enjoy more of that kind of fun for yourself you can virtually visit the doctor at: www.drdemento.com! 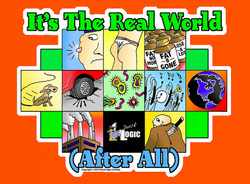 "Real World" T-shirts, mugs and more in our Swag Shop! Click it above or use the handy button below!